"So what is this Hare Krishna? 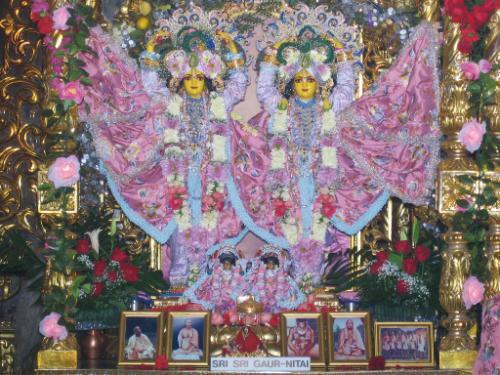 Hare means the energy of the Lord, and Krishna means the Supreme Personality of Godhead. So it is a prayer. There are three words only: Hare, Krishna and Rama, three words. That has been arranged in sixteen words: 'Hare Krishna, Hare Krishna, Krishna Krishna, Hare Hare/ Hare Rama, Hare Rama, Rama Rama, Hare Hare.' So our movement is that we request you to take up these sixteen words -- not sixteen words, three words, Hare, Krishna, Rama. But is is arranged in such a way that there are sixteen words. So anyone can take it by heart, these three words, and chant it. It is universal. And if you think that 'Oh, Krishna is the name of Hindu God,' if you have got any objection, then you may not chant Krishna, but you must have a name for God. Just like somebody, the Muhammadans, call Allah, the Jews call Jehovah, or somebody calls something. That doesn't matter. If you think that 'Why shall I chant the Indian name Krishna, Sanskrit name Krishna?' so Lord Caitanya says that there are millions and billions of names of God. If you think that this Krishna name is not very suitable, you can accept any name. That doesn't matter."